In this Intentional Read Aloud lesson, the teacher guides her children through a lesson on how characters grow and change throughout a story. View this version of the Bernice Gets Carried Away lesson for additional "look fors" and tips. Reading aloud to children is one of the most enjoyable and useful activities in an elementary classroom. Reading aloud to children creates a positive classroom culture, develops a shared language around literature, and inspires a love of reading. A read aloud becomes intentional when you plan to teach one skill, strategy, or behavior. Plan an Intentional Read Aloud by thinking about what you will say and do before, during, and after the reading. Tell the children what they will be learning, how it helps them as readers, and why you chose the read aloud book. The Intentional Read Aloud is the foundation of a balanced literacy program. Through the read aloud, you establish a stable of books and skills that the whole class knows. Use the Intentional Read Aloud to model fluent reading, build and check comprehension, and teach vocabulary in context. The Intentional Read Aloud is a springboard for future Reading Workshop, Writing Workshop, Guided Reading and Message Time Plus® lessons. During the Intentional Read Aloud you and your children have the chance to think about and discuss great books. Dig in deeply to explore the big ideas, themes, and concepts that make reading meaningful. Listen to a teacher's perspective on why she loves having the Intentional Read Aloud in her classroom. What is an Intentional Read Aloud? A read aloud becomes intentional when you plan to use the book to teach a specific skill, strategy, or concept. Whatever objective you choose, the focus of the Intentional Read Aloud is always on understanding, engaging with, and enjoying the book. Learn what makes an Intentional Read Aloud 'intentional'. Think and talk about books with children before, during, and after reading. Model reading behaviors like engagement, choosing books, and responding to texts. Teach children to monitor their understanding and use comprehension strategies. Teach story elements and text structures to organize understanding. Develop a stable of familiar books and shared understandings to use as foundations for Reading Workshop, Writing Workshop, and other literacy practices. Create charts and graphic organizers to anchor children’s learning and connect reading behaviors, skills, and strategies to literature. Gather children together on the carpet. Build or access background knowledge of the book, author, topic, or concept. Read the title, author, and illustrator. Call attention to parts of the book like the cover, author blurb, table of contents, dedication, etc. as necessary. Set the purpose for listening and responding. Explain the connection between the book and the text. Hold picture books open so everyone can see. Build comprehension by asking and answering questions, modeling thinking, and explaining vocabulary. Think aloud to demonstrate the literacy objective and other reading strategies. Engage the children and invite them to participate in the lesson. Discuss and respond to the book. Check for understanding by asking open-ended questions. Connect and extend learning to other literacy practices. “The fire of Literacy is created by the emotional sparks between a child, a book and the person reading. It isn’t achieved by the book alone, nor by the child alone, nor by the adult who is reading aloud. It is the relationship winding between all three bringing them together in easy harmony.” - Mem Fox, Reading Magic: Why Reading Aloud to Our Children Will Change Their Lives Forever. Help children develop a love for books and reading. Introduce children to the big ideas, messages, themes, and concepts found in literature. Support content in subject areas such as social studies, science, art, music, and math. Engage children in meaningful book discussions. Model for children how readers access and make meaning from books. Expose children to different genres and text structures. Model phrased, fluent, expressive reading. Create a literary community in the classroom. Expand children’s literary knowledge by developing their understanding of plot, character, themes, and setting. Expose children to different authors and illustrators. What are you currently doing in your classroom to make your read aloud intentional? Use the following questions to reflect on your practice and determine areas of strength and areas to enhance. How do you currently plan your read aloud lessons? Do you read aloud daily? Why or why not? How do you approach planning a read aloud? Do you plan to teach one skill or strategy? Or are your read alouds more open-ended, filled with spontaneous “teachable moments?” What are the benefits and drawbacks of both methods? What can you do to achieve a balance between the two approaches? How do you choose books for your read alouds? How do you determine if a book is worth reading? Do you consider children’s cultural and linguistic backgrounds when choosing books to read? Why is this important? 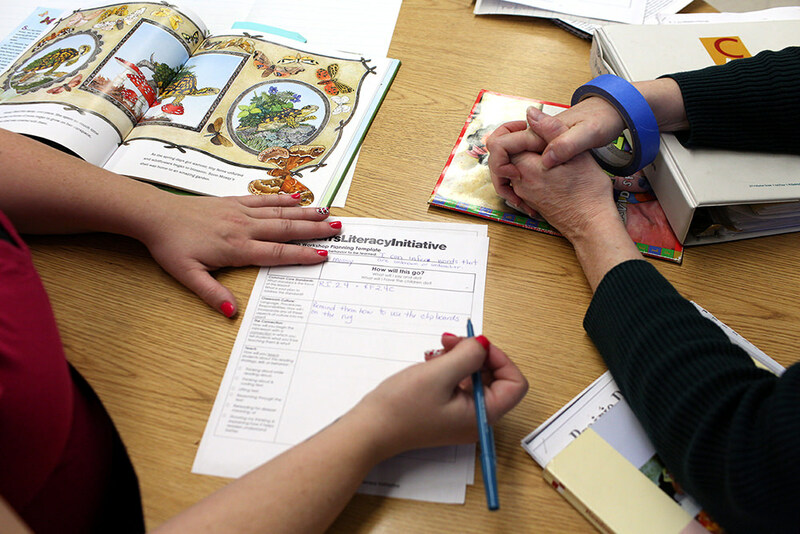 How do you decide on the primary literacy objective for your read alouds? What factors do you consider when making this selection? What do you look for when pre-reading texts? Why is pre-reading a book before you read it aloud to the class important? What tools do you use to build and check comprehension during a read aloud? What are some ways you build comprehension before, during, and after reading aloud? How do you know when children understand the text? How do you introduce a book before reading it to children? How do you currently activate the children’s background knowledge? Do you model how to make effective predictions before and/or during a read aloud? Do your children make reasonable predictions that they can support? Do you tell the children the purpose of reading a certain book to them and clarify what their role should be in listening and responding to the text? Is this a natural part of your read aloud routine? How do you currently select and explain vocabulary words to teach through your Intentional Read Alouds? Why is it important to pre-choose and explicitly teach vocabulary? Do you currently think aloud before, during, and after an Intentional Read Aloud? How is this strategy effective in supporting children’s comprehension? What does it mean to read with fluency and expression? Why is it important to do so? What kind of questions do you ask children during your read aloud? Are the questions you are asking producing a few words or more lengthy responses? Are your questions asking them to think and reflect or just to recall portions of the story? Do all the children in your room actively participate in the read aloud? Where do your children normally gather for read alouds? How is this setting important to their learning? What opportunities do your children have to participate in the read aloud? What strategies do you use to keep them engaged? How do you promote conversations about the books you read aloud in your classroom? When you read aloud to children, do you feel they are actively involved? What does it mean to be actively involved? How many times do you stop during your read aloud to model thinking or ask questions? How do you balance your stopping points in a way that lets you maintain a lively flow and pace? What are some things you currently do after you read to extend the lesson? Why have you chosen these activities? How do they help children? What supports do you put in place to ensure all children can participate, regardless of their language development? What do you currently do to promote language development during the read aloud? How do I get more children to participate in class discussions? One of the best ways to facilitate and deepen comprehension is through discussion. The best way to involve more children in the discussion is to use the “turn and talk” strategy. Everyone gets a turn to talk when you use “turn and talk.” Explicitly teach children how to turn and talk through a procedural lesson which will include co-creating an anchor chart. Post the anchor chart in the children’s line of vision to help them remember the procedure. When conducting whole class discussion, select children by using “pick sticks” to give everyone an opportunity to share their ideas and thinking. Can I use the same book for more than one Intentional Read Aloud? Absolutely! Rereading a book is a powerful tool for developing comprehension and vocabulary. Select a rich, high quality book that is worthy of deeper study. Luckily, you should have no trouble finding a book that your children will really love in your large and diverse CLI book collection. Set an objective for each reading of the book. During the first reading, your children will get the “gist” of the book. They’ll be able to retell the story or tell the key concepts in an informational book. In subsequent readings, your children can analyze characters’ motivations, examine the text structure, study writer’s craft, and explore interesting vocabulary. After the children have heard a book read aloud several times, their ability to read that book independently increases dramatically. Does every read aloud have to be intentional? An Intentional Read Aloud is a lesson that explicitly teaches a literacy skill or strategy using high quality children’s literature. The Intentional Read Aloud is an important component of the literacy block. Make time for it every day. However, not every read aloud is an Intentional Read Aloud. You can read aloud as part of a writing mini-lesson, a math lesson, or a content area lesson. Reading aloud is a great way to start and end the school day. One of the best ways to ease kids back into learning mode after a high energy activity like physical education or recess is a read aloud. Read aloud several times a day, making sure that one of your read alouds is an Intentional Read Aloud. Do I have to read a book in one sitting if it’s very long? The recommended time for an Intentional Read Aloud is 20 minutes. If it is going to take more than 20 minutes to read the book and complete the “before and after” reading activities, it is probably a good idea to read the book across multiple sittings. Be mindful of your children’s stamina. Our younger children find it hard to sit and be attentive for longer periods of time. It will be difficult to achieve the lesson’s objectives without your children’s attention. Reading a book across multiple days also has definite benefits for children. In each reading after the first one, they will have to recall what they have heard in the previous readings and integrate the new information into the current day’s reading. These skills will be useful later when the children read chapter books and textbooks. Should I make an anchor chart for every read aloud? An anchor chart is a way to make thinking visible when the class is learning a process, a strategy, or a procedure. Anchor charts can be co-created with the children when learning a strategy during an Intentional Read Aloud lesson. The class can refer back to the anchor chart when they practice the strategy in other lessons. However, you will not need to make an anchor chart for every read aloud. Having too many anchor charts can make it difficult for the children to find the information that they need and can create “visual noise.” Anchor charts are displayed as long as the children need them and find them useful. After that, they should immediately be retired. Intentional read alouds are my favorite part of the day! You can do so much with them and it is the BEST way to ignite a passion for reading in young children! Setting the goal for the reading is very effective for student engagement. In the video above, the teacher helps the students make text-to-self connection in order to infer how the character changes throughout the story. Read alouds and shared reading events do not need to be long to be effective. A short, powerful passage has far more impact than a long dull one. Try five to ten minutes a day for read alouds, then increase gradually as your students' stamina for listening improves. © 2016 Children’s Literacy Initiative. All Rights Reserved.